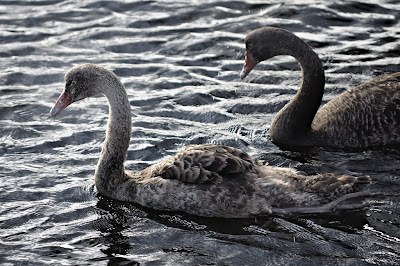 Found the swans along the Franklin foreshore today. I almost missed them, looking across the river with binoculars, when they were swimming about only a few metres from me. Just need to look down sometimes. Scooter seems well, and I watched him stand in the shallows on his one working leg. He had occasional balance problems, but otherwise seems to manage this OK. I still haven't seen him fully out of the water, and I don't know if or how he would do this. 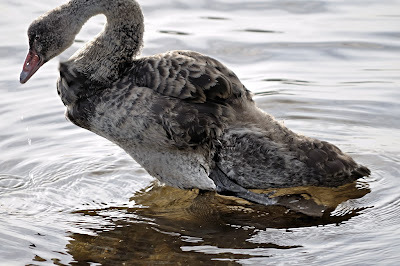 All the cygnets are getting darker and larger all the time, so it can be hard to tell whether you're looking at a juvenile or an adult depending on the light.